If plant parts have soil, fertilizer, dust or spray residue on them, they should be cleaned. Cleaning with a dry brush is preferred, but a damp cloth is adequate. Clean paper bags or envelopes are best for mailing tissue samples to avoid contamination. Do not place fresh tissue samples in plastic bags. The ideal time to sample soybeans is when the first bloom appears. However, if problems develop prior to bloom, the seedling can be sampled. Do not sample after pods have begun to fill. What part of Plant to Sample? All the above ground portion of the plant. Sample 20-30 plants at random. Select the most fully developed trifoliate leaves at the top of the plant (trifoliate leaf includes three leaves on one stem or petiole). Do not use upper leaves which have not developed to full size. Remove one or two trifoliate leaves per plant from 20-30 plants selected at random. Remove and discard all stems. Anytime between emergence from the soil and silking. Take the entire first mature leaf below the whorl - top of plant where emerging leaves coil or roll together. A mature leaf is completely unrolled from stalk and fully elongated. Do not include the sheath - the part attached to the stalk. Remove one leaf per plant from 15-25 plants selected at random in the field and or problem area. 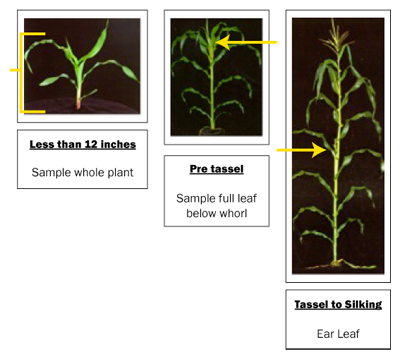 Take the entire leaf at the ear node (or immediately above or below it). Do not include the leaf sheath.